Brides of Dracula (1962) was the second film in Hammer's hugely successful Dracula series and something of an odd one out. 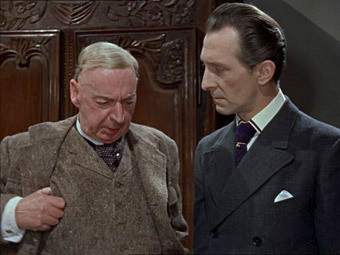 It's the only one in which Dracula himself does not appear or is even directly referred to, and the only one that doesn't dovetail with the films that preceded and followed it – indeed, the third film in the series, Dracula, Prince of Darkness, establishes itself from the off as a direct sequel to the first film. In spite of all this, The Brides of Dracula is widely and justly regarded as one of Hammer's best. 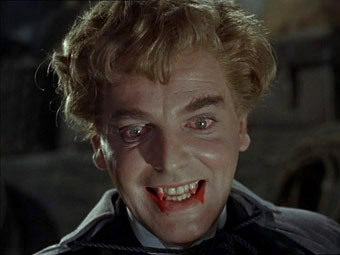 Viewed retrospectively, there are considerable advantages to being able to dump Dracula for one film (or two if you count Hammer's other vampire film of the period, Kiss of the Vampire), as it gives the quartet of screenwriters (Peter Bryan, Edward Percy, Jimmy Sangster and an uncredited Anthony Hinds) licence to play a few games with a formula that was to prove increasingly restricting in the later films of the series. And knowing that Dracula is not on board means that the first third is able to keep you guessing in a way that few of the subsequent films could. In that spirit, I'll keep the plot details brief. 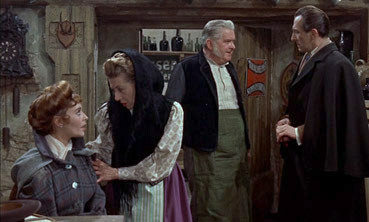 Young student teacher Marianne Danielle is being transported to her new post at the Badstein Academy, but before she reaches her destination she is abandoned by the coach driver at an inn run by a couple who'd rather she left as soon as possible. They're on the verge of taking her to Badstein themselves when the inn is visited by the ageing Baroness Meinster, who offers Marianne a bed for the night at her cavernous home, something you just know she shouldn't accept but does. 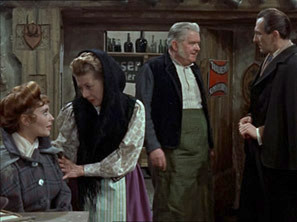 Initially assured that she is alone with the Baroness and her housekeeper Greta, Marianne soon learns of the existence of a son whose sickness apparently requires he be kept under lock and key, but whose obvious suffering tempts her to come to his aid, with disastrous consequences for the local community. As directed by Terence Fisher, the leading light of Hammer's pool of filmmaking talent, this setup is milked for all it's worth, matching the atmosphere of suppressed evil of the film's illustrious predecessor (also directed by Fisher) and taking advantage of our expectations to delay both the establishment of the vampire threat and the introduction of Professor Van Helsing until almost a third of the way in. Being an attractive young woman, we know that Marianne has a date with a vampire, but more than once we are effectively misdirected as to whom it might be, while the back story reveal is handled with compelling aplomb. Despite some serviceable work elsewhere, it's once again Peter Cushing who steals the acting honours in a performance of typically commanding authority and sometimes thrilling physicality. What is often forgotten with Lee's subsequent return to the series is that this was the last film to feature Cushing's Van Helsing until his modern day return in Dracula A.D. 1972. As Dracula stand-in Baron Meinster, David Peel plays his vampire as a manipulative charmer, a lethal symbol of the landed gentry at its most power-corrupted and destructive. Kept locked away by a mother who despairs at what he has become, their bond of blood nonetheless prevents her from letting him die as she knows she should and prompts her to provide him with a regular supply of fresh victims to feed on. She's also the first turned vampire I can recall who willingly agrees to be staked rather than become a predatory creature of the night. Like most vampire films worth their salt, Brides of Dracula both acknowledges and expands on the accepted vampire movie lore. Having rejected the idea that vampires can metamorphose into animals in Dracula, the power to take on the form of a bat is restored here, though curiously (and conveniently) unavailable to the Baron when held in leg irons. Cushing's fiery conviction sells the idea that the vampire's infective bite can be neutralised by a combination of purifying fire and holy water, but extending the improvised crucifix from Dracula to suggest that even the moonlit shadow of a cross-shaped object would prove lethal to vampires is really pushing it, rendering this supposedly deadly creature vulnerable to a wide range of everyday objects, from street signs to window frames and even correctly positioned arms if there's a light behind them. But these are small quibbles in an otherwise tautly executed and enjoyable side-step for a series chiefly associated with the very character not present in this episode. Consistently strong on atmosphere, it tells its story in compellingly waste-free fashion, while the action, when it comes, bristles with energy. As a final note, I can't be the only one who spotted the similarity between the wildly smiling Baron Meinster as he rises after his attack on Van Helsing and the fantasy image of Alex as a vampire in A Clockwork Orange. As with the Showbox release of Evil of Frankenstein, the framing is the main issue here, with the original 1.66:1 picture cropped to 4:3 with a resulting loss of picture information on both sides. In other respects the transfer is in fine shape, with very good detail and contrast, sometimes vibrant colour and little sign of dust and damage. It should be noted, though, that the version in Universal's region 1 Hammer Horror Collection is in the correct ratio of 1.66:1 and is anamorphically enhanced. You can see the framing differences in the comparison below. The Dolby 2.0 mono soundtrack has the sort of faint background hiss typical of films of this vintage, but is otherwise clear and free of noise. Distortion is minimal, even in the louder music cues. There's a brief and breezy Trailer (0:57), and a Gallery containing 7 monochrome publicity stills. Despite some iffy tinkering with vampire movie codes and conventions, Brides of Dracula is Hammer on fine form and provides further evidence of the considerable talents of both Terence Fisher and Peter Cushing, who attack their tasks with energetic conviction. A shame, then, about the cropped 4:3 transfer, which loses out to the correctly framed anamorphic transfer in Universal's region 1 package.